Being that it's the first Christmas at Brainchops, I am pleased with the opportunity to share with you the short-but-sweet holiday EP 'Icepak' by electronic music producer Milieu. I know what you're thinking: We've already been bombarded with 147 different versions of "Baby It's Cold Outside" and "Winter Wonderland" and we're only 10 days into December, but not to worry; Milieu gives us something completely different. In this refreshing IDMer's take on holiday cheer, the artist subtly dips his brush into a few familiar Christmasy sounds and paints us an abstract of original work that can even be enjoyed year-round. The childlike melody in the "Mornin' Organ" solo intro sets a playful, memory-invoking tone with analog tape recorded warmth while "Boiled Custard Beats" sneaks a little funk under the tree with a fun synth bassline, echoey tubular bells and a beat to shake your bits to. "Little Sparkles" fills my head with hazey visions of marching toy soldiers banging their snares and ghostly sugarplum faeries floating by in slow motion, with the last 14 seconds calling Aphex Twin's "Mookid" to mind. 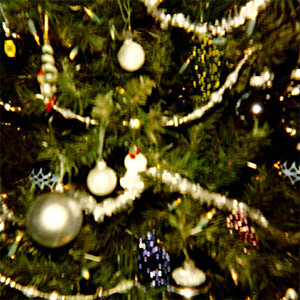 Lazy sleigh bells round the EP out nicely in "Snowradio" which captures that moment of stillness after the last Christmas Eve party guest has gone home and all that remains is the sound of looping static on the record player while you stand at the window and watch the snow fall. Rather than rehashing old themes to death, Milieu ignores the commercialism of Christmas and emphasizes the little things that make us feel warm and fuzzy this time of year. And as a gift to his listeners, you can pay what you want for this release (even nothing), but these 17.2 minutes of bliss are sure to inspire your spirit of giving.